By third grade, children's curiosity has expanded beyond their homes and families into their communities -- and to outer space. Teaching children about the sun at this level is aided on one hand by their natural desire to understand the world but made more difficult by their rudimentary knowledge of science. Most will be challenged and satisfied with a simple explanation of what the sun is made of, how it is different from Earth and why it is important. The Earth moves around the sun. A year is 365 days because that's how long it takes the Earth to go around one time. Seasons change depending on which part of the Earth is tilted closest to the sun. The sun is the source of nearly all the Earth's energy. Without the sun, the Earth's surface would be cold and lifeless. And without the sun's gravity, Earth would fly off into space. The Romans named the sun Sol. That is why this area of the galaxy is called the solar system. It is similar to other stars you see in the sky, but it looks larger to humans because it is the closest star. The sun is made completely of gases. There is nothing solid to stand on at the sun -- even if you wanted to stand on something so hot. The different gases rotate, the same way the Earth spins on its axis. It takes the sun about 26 days to turn around completely, while the Earth takes one day to make one spin. The sun is 150 kilometers (93 million miles) away from the Earth. If you drove there at 96.6 kilometers per hour (60 miles per hour), it would take 177 years to reach it. Still, sometimes large eruptions from the sun reach man-made satellites and disrupt communications devices. It takes light eight minutes to get from the sun to Earth. If you measure all the matter in the solar system -- the sun, planets, moons, asteroids, comets -- it turns out that 98 percent of it belongs to the sun. The sun is much, much bigger than anything around it. That's why everything else is orbiting the sun: The sun's gravity holds nearby objects in place as they travel. The radius -- the distance from the middle to the surface -- of the sun is more than 100 times bigger than the Earth's radius. The average temperature on Earth's surface is about 16 degrees Celsius (61 degrees Fahrenheit). The average temperature on the sun's surface reaches 5,700 degrees Celsius (10,292 degrees Fahrenheit). 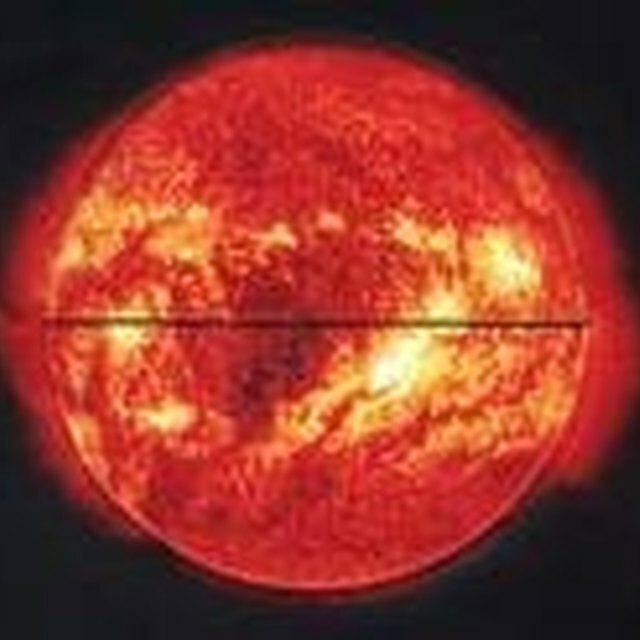 And, as you leave the surface, the sun's atmosphere gets hotter and hotter because hot gases rise, while cool ones sink. So around the sun temperatures reach millions of degrees. The sun is not "on fire." It uses a process called nuclear fusion to turn hydrogen -- a type of gas -- into helium, the same gas used in balloons. Bronson, Sarah. "Facts About the Sun for the Third Grader Level." Sciencing, https://sciencing.com/sun-third-grader-level-6130547.html. 24 April 2017.